Donor Advised Funds enable you to make a gift to the Berrien Community Foundation then remain actively involved in suggesting uses for your gift. 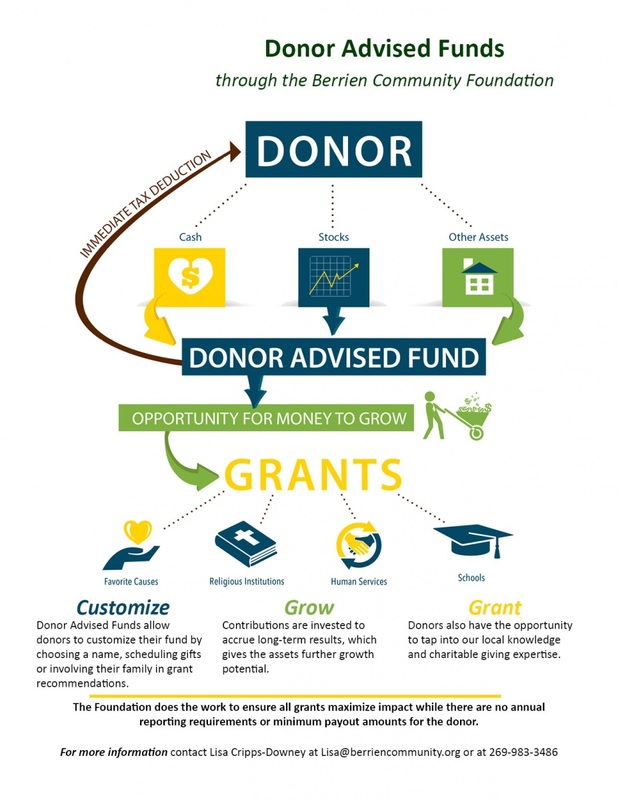 Donor Advised Funds are a convenient, flexible tool for individuals, families, businesses or groups that want to be personally involved in suggesting grants made possible by their gifts. Your initial gift establishes your donor advised fund. You choose the name of your fund. The fund can be set up in your name, the name of your family or in honor of an organization you choose. When you establish a donor advised fund, you have the opportunity to recommend grants from the fund enabling you to support the causes you care about locally, or throughout the United States. If you prefer grants can be made anonymously. Funds can be permanently endowed to ensure a legacy of giving or created as a giving fund in which the assets are invested for growth but the full balance is available for grant making. In the year your gift is made, you will receive tax benefits. The Berrien Community Foundation staff will handle all the administrative details, issue grants and provide you with evaluation reports from your grants. The staff is also there to consult with you regarding community needs and the status of an organization. There are also benefits to creating a donor advised fund instead of a family foundation. For more information call or email Berrien Community Foundation President Lisa Cripps-Downey at 269-983-3486.